I do not like pickled eggs. I do not understand how anyone can possibly like pickled eggs. I certainly have no intention of tasting the pickled eggs I have made. That said, my entire family loves pickled eggs. They don’t understand how I can possibly not like pickled eggs. Whenever I ask if there’s anything they’d like me to buy when I go shopping they frequently beg me to buy pickled eggs for them from the supermarket. I’m known as “the weirdo” of the family who hates pickled eggs. I freakin’ hate pickled eggs, man. Firstly, my family would really love some pickled eggs. Secondly, it’s come to my attention that a lot of people freakin’ love pickled eggs and apparently they’re lovely served alongside salads and cold meats. And fourthly, they’re an ideal low FODMAP snack for those who like pickled eggs. Joking aside, jars of pickled eggs are really expensive to buy. The last time I went shopping they were priced at £2.95 for a jar of 4 or 5 eggs. That’s pretty ridiculous when you consider how cheap eggs are to buy. Therefore, when I saw that my aunt had made her own I figured I could keep my family happy while keeping my purse happy at the same time. I didn’t have all of the spices that her recipe suggested so I just kept mine simple and used what I had at hand instead. 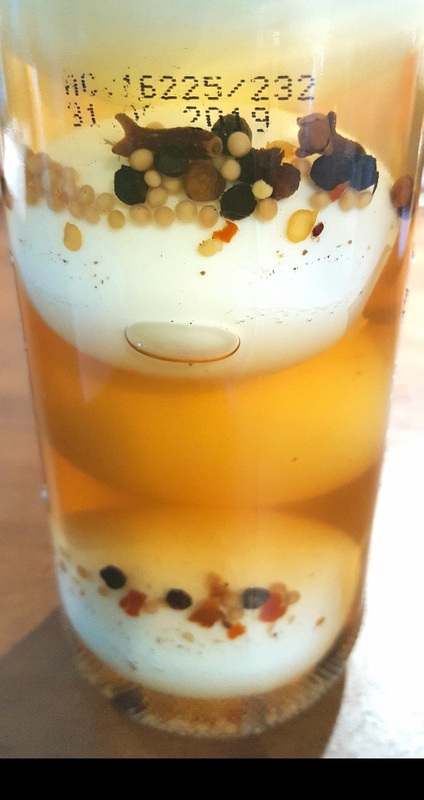 As it turns out, it’s incredibly easy to make your own pickled eggs! Essentially all you have to do is hard boil your eggs and peel them, make your pickle vinegar, sterilise your jars and then pop all of your ingredients into them and leave them for 2 days until you eat them. It’s as easy as that. Just keep the jars of pickled eggs in the fridge and use them within 3 months for best quality. Sterilise your jars by washing them in hot water, rinsing them out and then placing them on a baking tray and putting them in a hot oven until they are dry. Once they’re dry switch off the oven and leave the jars inside the oven until you need them. Hard-boil your eggs by cooking them in boiling water for at least 12 minutes and then de-shell them. Put all of your pickling vinegar ingredients into a saucepan and bring it to the boil, stirring until the sugar is dissolved. Simmer the liquid for 10 minutes. Take your jars out of the oven, place your hard-boiled eggs inside them and add the pickling vinegar until it reaches the top of the jar. Seal the jars with the lid and leave to cool. Once cool, put the jars in the fridge and leave for 2 days before eating. I love pickled eggs but only ever an occasional treat as so expensive. I will try these! 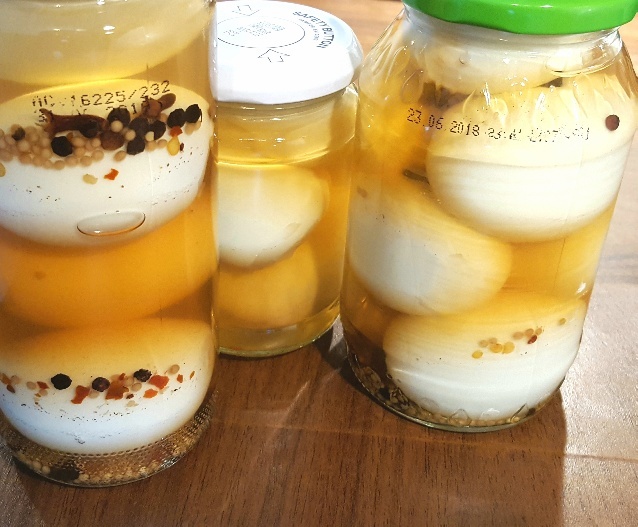 One question: After de-shelling the eggs do you need to rinse or blanch in hot water or anything before adding to the sterilised jars, or would the hot vinegar kill off anything on them?